Robotics in Architecture is a relatively young subject within contemporary design practice. At the Faculty of Architecture we are currently building up a Research Lab that will be dedicated to this new research field. In an environment with rapidly growing cities, the lab will have its emphasis on the discovery of new methods, techniques and material assembly systems that have a meaningful and sustainable impact on Architecture and the context of Hong Kong and the PRD. 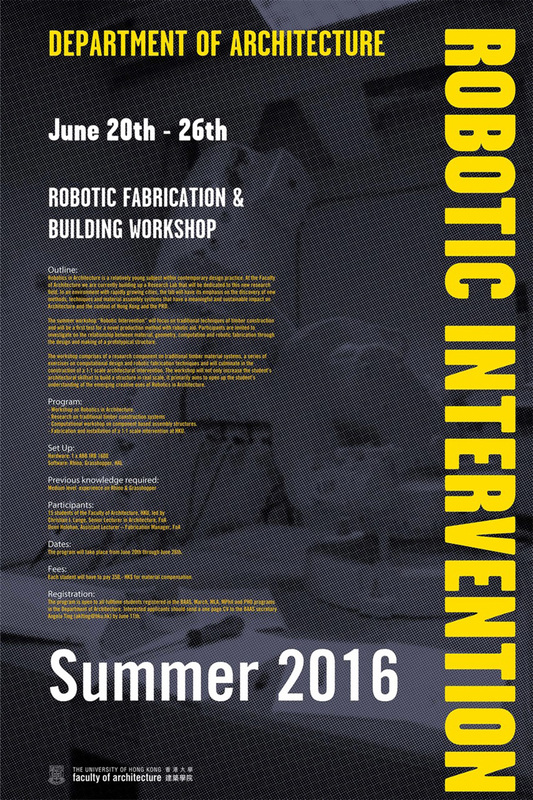 The summer workshop “Robotic Intervention” will focus on traditional techniques of timber construction and will be a first test for a novel production method with robotic aid. Participants are invited to investigate on the relationship between material, geometry, computation and robotic fabrication through the design and making of a prototypical structure. The workshop comprises of a research component on traditional timber material systems, a series of exercises on computational design and robotic fabrication techniques and will culminate in the construction of a 1:1 scale architectural intervention. The workshop will not only increase the student’s architectural skillset to build a structure in real scale, it primarily aims to open up the student’s understanding of the emerging creative uses of Robotics in Architecture. – Workshop on Robotics in Architecture. – Computational workshop on component based assembly structures. – Fabrication and installation of a 1:1 scale intervention at HKU. The program is open to all fulltime students registered in the BAAS, March, MLA, MPhil and PHD programs in the Department of Architecture. Interested applicants should send a one page CV to the BAAS secretary Angela Ting by June 11th.